Description of decorations: The bottom consists of a layer of peat (2 cm) covered with a thick layer (3 cm) of amber quartz sand (for aquarium use), currently partially naturally covered with organic debrys (natural deposit produced by the aquarium) and plant debrys (collected in nature): fallen leaves, broken branches, Fabaceae pods (similar in shape to those of Erythrina sp. ), palm leaf and palm fiber. Hardscape consists of one wooden root (purchased). Description of equipment: Lighting: 150w CFL lamp 6400K (14000 lumens) with aircooled reflector (Spudnik 150, 97% reflection). Photoperiod is 12 hours (set for comfort 8:00-20:00). Filtration: external 3-stage filter: mechanical filter-media (coarse, fine), biological media. Delivery pump 2700 L/h (Sicce Syncra 3.0) real water-flow about 1000 L/h (set off during photo and video making). In/out filter system consist on transparent (unmovable) pipes passing through the bottom of the tank. Heating: external in-line heat exchanger (Hydor ETH 200) set at 27°C. CO2 cylinder system (turned off) with external in-line diffuser (JBL ProFlora Direct). 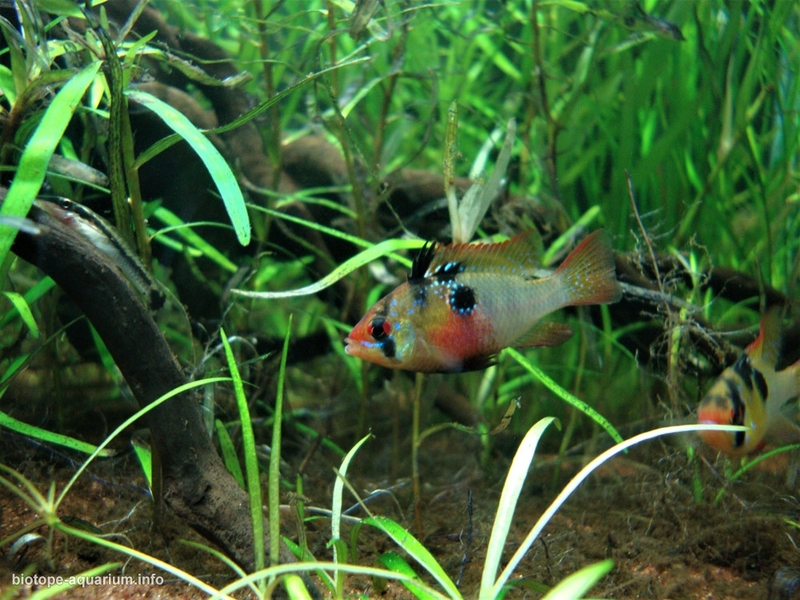 No CO2 has been erogated during the last year, due to the sensitivity of the fishes to it. Water parameters: Transparent water obtained by adding buffers to RO water: mineral salts and low concentrated fertilizers. Fertilization were optimized in order to maintain a low nutrient content. Temperature: 28.2° C (year average, minimum at 27°C from November to May, maximum at 30.5°C in August due to summer local high temperature), pH 6.6-7.2, KH 2-3 (HCO3- about 65 ppm), GH 4, CO2 2-15 mg/L, Fe2+ 0.05 ppm, NH3 0 ppm, NO3- < 5 ppm, NO2- 0 ppm, PO43- 0.5 ppm, Mg2+ 5 ppm, Ca2+ about 20 ppm (calculated from GH and Mg2+ values) K+ 8 ppm (water parameters were measured with JBL TestLab). Description of the area surrounding the biotope: The Capanaparo River is located in Colombia and western Venezuela and is a moderatly black water, tributary of the lower Orinoco basin. It born in in the Arauca department of Colombia a few kilometers from the border with Venezuela. Its extension is 650 kilometers of total navigable area, of which approximately 225 are in Colombia. Its waters cross the flooded plains in Apure state and the National Park Santos Luzardo (Capanaparo-Cinaruco National Park), then feeds the waters of the Orinoco River. These lands are characterized by the presence of swamps, estuaries and morichales. Around the river we can see an extensive forest of approximately one hundred meters where many animals lives. The Capanaparo River has a great variety of species, including threatened species like caiman (Crocodylus intermedius), turtle (Podocnemis unifilis) and river dolphin (Inia geoffrensis). On its banks is located the population of La Macanilla, originally an indigenous community. During the dry season, the river attracts a lot to tourism since it is allowed to practice sport fishing (mostly Cichla orinocensis fish, which are protected by law and it has helped them from being overfished) and camping on its extensive beaches where you can see sunbathing caimans. During rainy season, in the middle of the river, extensive field of dunes and lagoons are formed. Most of the Capanaparo river basin, like other lower Orinoco basin tributaries (Apure), is located in a vast seasonal alluvial plain called the Llanos, which represents a highly productive ecosystem cover for the vast savanna vegetation. The population density in the Llanos is relatively low and the area is essentially rural. Overall, human influence is not extensive in the basin and the relationship between the river and its floodplain are principally natural. The hydrological cycle in the river is accompanied by major changes in the dissolved element concentrations. The temporal variability of these variables is controlled by the changes in the flow values, suggesting that a strong diluition effect is produced during the wet season. The annual hydrological regime basically regulates regional and local diversity and abundance patterns. Two hydrological periods are characteristic of the region. Water chemistry varied little between lentic lagoon and lotic channel habitats. The river presents an area of riparian forest with open savannas and associations of morichito palm (Mauritiella aculeata, Arecaceae), with the presence of permanent water. These habitats maintain an effective connection with the main channel of the river throughout the year. A rainy period (May-October) in which the riparian forests are flooded and the organisms are dispersed in the flooded savannas where they take refuge and fulfill reproductive and feeding activities. Dense stands of vegetated patches may be essential for survival and maintenance of populations of prey taxa that need to avoid predators, especially during the dry season when predator densities increase. Submerged vegetation, is known to mediate predator-prey relationships via increased structural complexity. The dry period is associated with the continuous descent of water levels, which forces fish and other aquatic organisms to migrate from forests and floodplains to the main channel associated littoral habitats. Here drainage canals discharge water to the main river (Target Biotope). Description of the underwater landscape of the biotope: Capanaparo River is a floodplain river, with either clear-water or black-water characteristics of low suspended sediments (high transparency within 1-3 m), low pH values, conductivity, solute, and nutrient concentrations. Three types of habitats were found: 1) open sandy beaches (> 95% of the substrate formed by coarse sandy, nutrient-poor soil), which are located along the main channel of the river; 2) the main channel of the river, which was characterized by moderate currents (~ 0.2 m / s), depth between 5 and 12 meters, and generally sandy substrates. 3) backwater type areas, covered with morichito palm, which presented a substrate with a high proportion of organic matter: leaf litter, aquatic grass, branches and large woody debris. Vegetated habitats were defined as having > 90% of coverage by large woody debris derived from riparian vegetation. Also, the speed of the current of this type of habitat is very slow (<0.015m / s) and depth ~ 1 m. These systems have continuous availability of food, supply of material allochthonous, habitat for refuge from predators and reproduction. These factors are probably responsible for the higher species richness found in vegetated habitats. 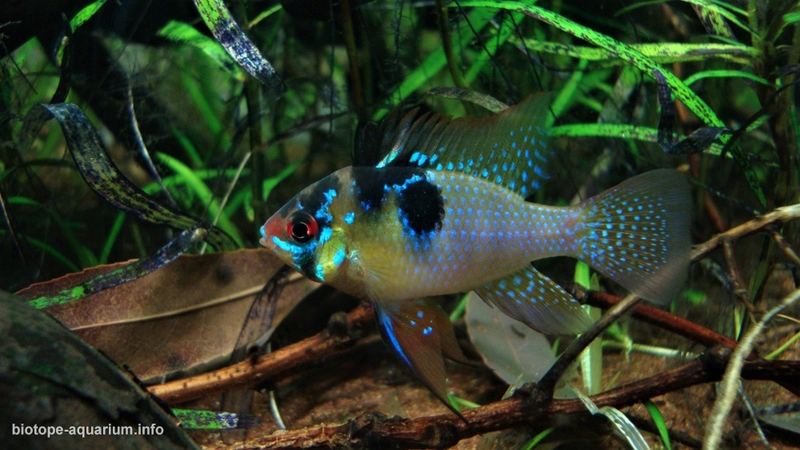 41 species of fish were only collected in habitats with morichitos, indicating the importance of these habitats to maintain fish diversity. In structurally complex habitats, specialist species also can exploit specific food resources to which they are morphologically or physiologically adapted to utilize. 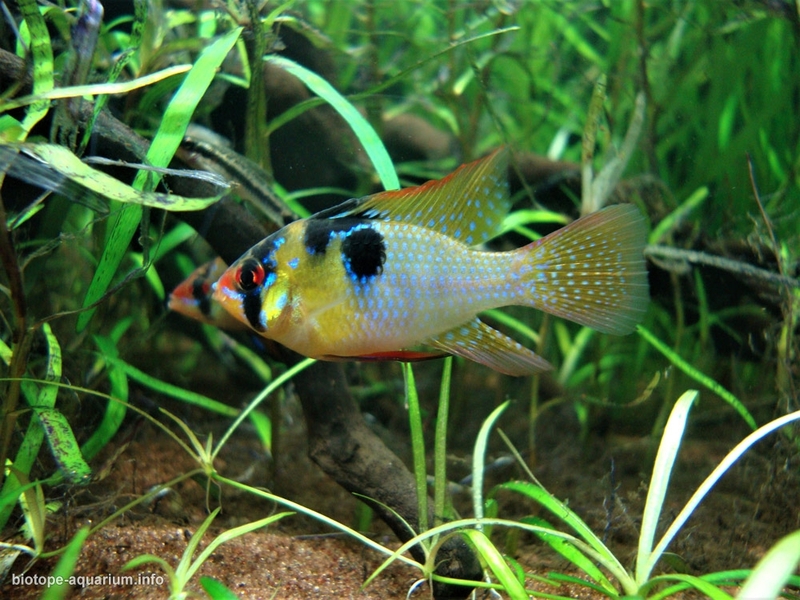 For example, in vegetated patches are found a relatively high abundance of small invertivorous cichlids such as Ram cichlid (Mikrogeophagus ramirezi) and small catfishes of the Doradidae family with different body shapes and feeding habits. Although were not evaluated it was apparent that vegetated patches contained a high abundance of shrimps and other macroinvertebrates. Drainage canals present a higher current water, where dense vegetation grasslands sways rooted in the sandy soil, which is partially covered with organic matter. Here some debris typical of morichito habitat and surrounded area are hold back by plants. Water is clear, and less acidic, due to the high rainwater seasonal precipitation. 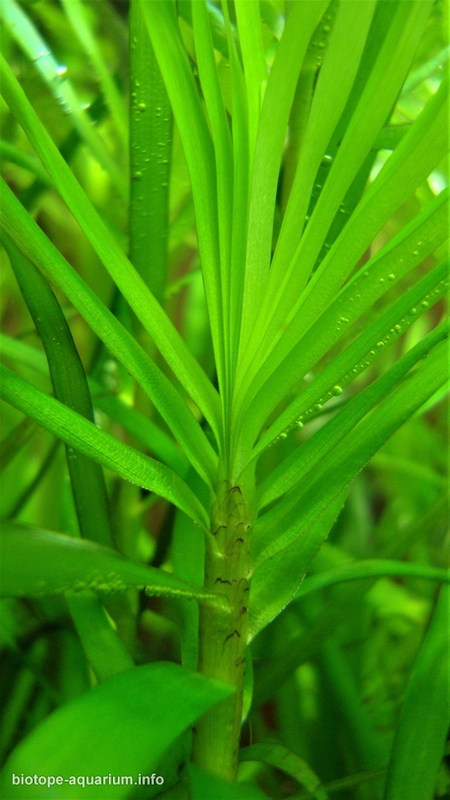 Although the low nutrient content of water, its moderate water replacement allow even to high demanding plants to grow (such as Eichornia azurea, E. diversifolia and Ludwigia inclinata). The target biotope soil consist of amber sands covered with organic matter and plant debris in correspondence of dense vegetation. Water is clear, due to the high rainwater seasonal precipitation. Ram’s habitat is quite variable, due to its extension. Rams are normally found in deep water not more than 60cm, normally about 30cm, in areas with no shade. The habitat has free swimming areas and fully covered areas of vegetation that shield from the stream and provide shelter. 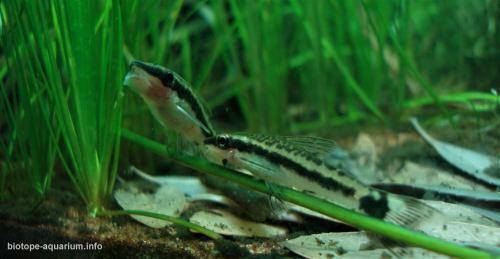 In this natural habitat they spend their time feeding on the organisms found in organic sediments and showing their territoriality by contracting the fins and expelling other Rams or other fish from their territory. In some occasion the male could show aggressive behavior aganist the partner female too, in order to force her to spawn. Description of the parameters of the habitat: Not many numerical data were found. The following data were recovered putting together data from of some references. Temperature 26.0 – 31.2°C, pH 5.0 – 7.6, Conducibility 35-60 µS∙cm (at 20°C), TSS (dry residue) 2-15 mg/L, NO3- 7 – 11 µg/L, PO43- 0.9 – 2.7 µg/L, total alkalinity < 0.5 mg/L, Hardness 6 mg/L. List of fishes and invertebrates occurring in the nature biotope: Within the sub-basins that drain towards the Orinoco, the greatest diversity reported is for the Apure rivers (390 species), Caura (384), Meta (378), Cinaruco (300) and Capanaparo (201). In Capanaparo river, four orders grouped the largest number of species and families: Characiformes and Siluriformes represented 75% of the total species reported, followed by the orders Perciformes and Gymnotiformes (13% and 6% respectively): Hemigrammus rhodostomus, Carnegiella marthae, Hyphessobrycon bentosi, Moenkhausia caudomaculatus, Anostomus anostomus, Nannostomus eques, Apistogramma hoignei, Mikrogeophagus ramirezi, Aequidens diadema, Heros severum, Mesonauta insignis, Satanoperca daemon, Cichla orinocensis, Myleus rubripinnis, Serrasalmus rhombeus, Pygocentrus cariba, Hoplias malabaricus, Potamotrygon motoro, Electrophorus electricus, Leporinus fasciatus, Platydoras costatus, Hoplosternum littorale, Otocinclus affinis, Farlowella mariaelenae, Panaque maccus, Hypostomus plecostomus. List of plants found in the nature biotope: Llanos Plants biodiversity reach 200 species: Cabomba furcata, C. aquatica, Helanthium bolivianum angustifolius, Helianthium tenellum, Eichhornia azurea, E. crassipes, E. diversifolia, Eleocharis sp. Eriocaulon cinereum, E. sp., Heteranthera limosa, H. reniformis, Hygrophila guianensis, Lemna sp., Limnobium laevigatum, Ludwigia helmintorrhiza, L. inclinata, L. inclianta var. verticillata, L. sedoides, Najas indica, Nymphaea rudgeana, Pistia stratioites, Phyllanthus sp., Rotala mexicana, Sagittaria guyanensis, Syngonanthus sp., Utricularia sp. Rial, Anabel. (2007). Flora y vegetación acuática de los Llanos de Venezuela con especial énfasis en el humedal de los llanos de Apure.. pp.99- 106. Lasso, C. A., J. S. Usma, F. Trujillo y A. Rial (Editores). 2010. 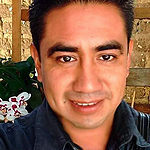 Biodiversidad de la cuenca del Orinoco: bases cientificas para la identificacion de areas prioritarias para la conservacion y uso sostenible de la biodiversidad. Instituto de Investigacion de Recursos Biologicos Alexander von Humboldt, WWF Colombia, Fundacion Omacha, Fundacion La Salle e Instituto de Estudios de la Orinoquia (Universidad Nacional de Colombia). Bogota, D. C., Colombia. 609 pp. Winemiller, Kirk & Taphorn, Donald & Barbarino-Duque, Aniello. (1997). Ecology of Cichla (Cichlidae) in Two Blackwater Rivers of Southern Venezuela. Copeia. 1997. 10.2307/1447287. Mora, Abrahan & Laraque, A & Moreira-Turcq, Patricia & Alfonso, Juan. (2014). Temporal variation and fluxes of dissolved and particulate organic carbon in the Apure, Caura and Orinoco rivers, Venezuela. Journal of South American Earth Sciences. 54. . 10.1016/j.jsames.2014.04.010. At first glance we see a great development of the plant community. In terms of design it looks very good. Basically as a recommendation I suggest adding a bit of detritus to give a touch of greater naturalness. Good job!